Hello, will like to share a Rhino 3D Recording about Y-shape NURBS Surfacing. This video shows the initial surface construction. For better results, the process should be iterative with further refinements entailing the reconstruction of initial surfaces. This is a ‘long method’ taking into consideration surface continuity. Enjoy the video. Please leave comments if you have queries. Thanks. 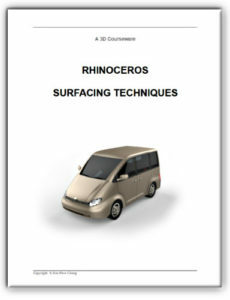 To purchase Rhinoceros Surfacing Techniques Book via Amazon, click on book cover image below. Note: The above video tutorial is not included in the book.